Two very different vessels were seen in the James Watt Dock, each receiving attention at the Garvel repair yard. 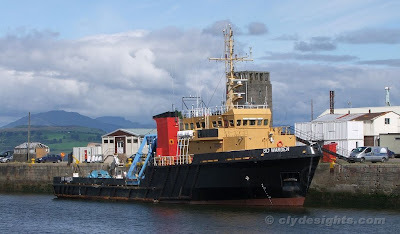 SD WARDEN is a ship that was originally used as a trials vessel but is now employed on Range Maintenance duties at Kyle of Lochalsh. She was built in 1989 by Richards Shipbuilders at Lowestoft for the Royal Maritime Auxiliary Service and later joined the Serco Denholm fleet when the operation of naval support services became a commercial operation in 2008. Berthed ahead of SD WARDEN was the CalMac ferry CLANSMAN, completing repairs after having been fitted with a new crankshaft in one of her main engines. CLANSMAN sailed on trials later in the day and then returned to Oban to resume serving island communities on the west coast.